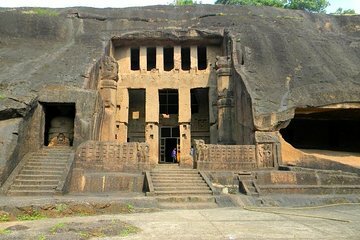 Depart Mumbai for the morning to visit the spectacular Kanheri Caves on a half-day private tour with an informative guide. Head to Sanjay Gandhi National Park where the UNESCO World Heritage-listed Kanheri Caves served as a Buddhist center for more than 1,000 years. Dating to the first century BC, the complex of 109 rock-cut caves is one of the oldest cave formations in India. Includes private guide and vehicle, and hotel pickup and drop-off. Chetan picked us up at our hotel promptly at 830am. We had a separate driver, so Chetan was able to give us a lot of background information on the way to caves. Once we got to the caves, there were many monkeys near the entrance. The entrance fee was very small that we had to pay ourselves. We saw about 6 of the most significant caves out of 100 total caves and Chetan did a great job with describing their history and significance. We were returned to the hotel at about 1130am as promised. Great excursion! We had a fantastic time on the Kanheri Caves tour. Our guide, Miss Jerroo, was absolutely wonderful.